Christmas Fruit Mince PiecakenWhat do you get if a Pie marries a Cake? Piecaken! This recipe is brought to you by Woolworths! What is a Piecaken you might ask! A Piecaken is a Pie, cooked IN A CAKE and it is EPIC! Yes, you read that correctly! Today we will show you how to make a Christmas Fruit Mince Piecaken – we use the delicious Woolworths Fruit Mince Pies to make a Christmas Dessert that Aunty Susan will tell all her Bridge friends about for years to come! Now you may see some really complicated Piecaken recipes on Pinterest and think – there is NO WAY I can do that… well, we have made this so simple that anyone can do it. Our Christmas Piecaken is best made on the day you eat it, and it is even better WARM. The pastry from the Fruit Mince Pies almost melt into the cake batter – giving you a delicious ‘pocket’ of fruit mince that just melts in your mouth. 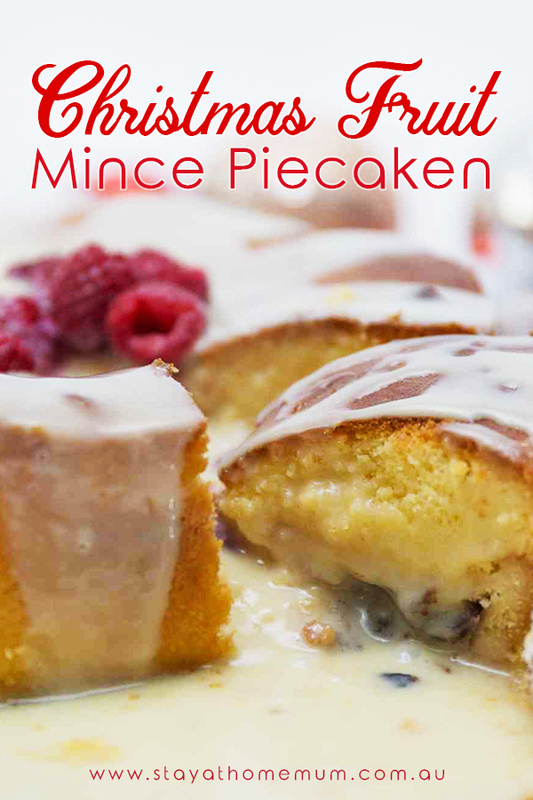 Serve Christmas Piecaken with custard and ice-cream! Grease a 22cm Springform pan well with butter or canola spray. Make up the Vanilla Cake Mix from the Woolworths Vanilla Cake with Tray Kit (you can ditch the icing, tray and Rainbow Sprinkles) according to the instructions on the back of the packet. Once the batter is ready, pour enough cake batter on the bottom of the Springform Pan to cover the bottom (about 1/3 of the mix). Carefully remove the Woolworths Fruit Mince Pies from the packet. Space them evenly around the outside of the cake pan (but not touching the sides) and one in the middle. Pour the remaining cake batter over the top. Tap the base of the Springform Tin firmly on the bench a few times to ensure the batter totally gets in and around the Fruit Mince Pies. Pop in the oven and cook for about 40 minutes. Use a skewer to ensure it is cooked through. Release from the pan, and serve warm! If you want to impress your guests and cut exactly into the middle of a fruit mince pie when serving, pop a toothpick in the centre of all the fruit mince pies before pouring on the batter. Cook with them in (it won't hurt it) - and you will get the middle every single time! For best results, serve it warm with custard and ice cream.